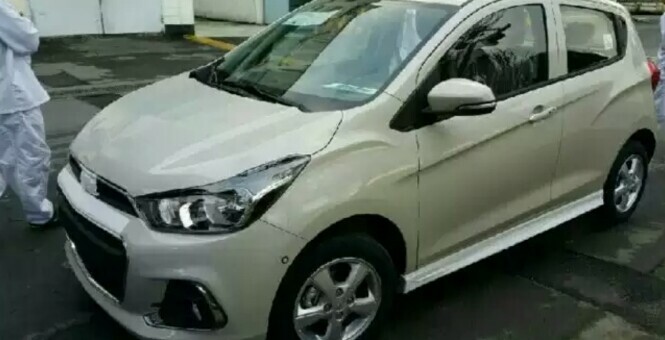 We’ve known the next-generation Chevrolet Spark would be built in South Korea ever since a local labor union spokesperson confirmed the car would arrive in 2015. It would appear General Motors’ Changwon Assembly plant is nearly ready to accommodate the new hatchback, with a completely uncovered 2016 Spark being spotted in the country. These photos were found by Autoevolution on Korean photo and video sharing website vav.kr. The 2016 Spark’s close relation to the Opel Karl and Vauxhall Viva is obvious, however unlike those models, the Spark has quirky door-mounted rear entry handles, just like the current model. The Spark may share a platform with the Viva and Karl, but we have our doubts North American models will share engines with them. The only engines announced for the European variants so far is a 1.0-liter three-cylinder with 75 hosepower. Cars with less than 100 horsepower don’t really fly with consumers in North America, so were expecting to find a more powerful mill from GM’s new line of Ecotec motors in the Spark. The 2016 Spark is rumored to make its debut in the spring of this year. Will GM Korea continue to manufacture the Spark EV version? Now that GM announced the Bolt EV for October 2016, the Spark EV market , which was limited to California and Oregon, will be reduced to even less sales. i HOPE you added a 6 speed transmission and added road sound dampening! i own a 2013 spark manual and am always looking for 6th gear as 5th just doesn’t seem enough to slow down the rpm on the highways and freeways. Megatron on:Ask Away: What Do You Want To Know About The Cadillac CT5?